LOS ANGELES, CA: Julian Construction, Inc. (julianconstruction.com), a foundation construction and general contractor company in Los Angeles, has had many years of experience in the construction field, largely with their specialty of home foundation repair and replacement but also home construction projects such as the construction of retaining walls. Due to the complexity of the process and the number of different types of retaining walls that may be used, the company strongly recommends that only a licensed professional construct a retaining wall for a home. A retaining wall is a stabilizing structure used when soil on a slope threatens to spill and cause soil erosion, ruining the landscape or causing other problems with the home’s foundation. A retaining wall holds back the falling soil and redistributes the pressure of the sloping ground. Many different materials are used for a wall, such as concrete, steel, stone, brick, composites, wood and even glass. There are also several different types of walls, from those that use the wall’s own weight to hold back the soil to those which are supported by heavy steel cables. 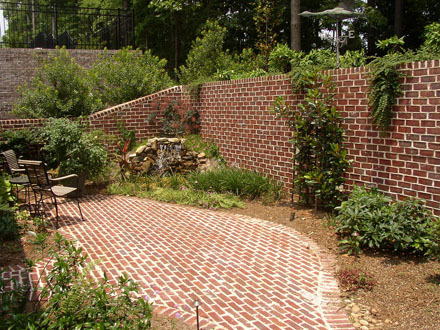 The type of wall needed is determined by the type and quantity of soil in the landscape, as well as the amount of space for the wall and other factors. Due to the variety of different types of retaining walls, each one required by a different set of circumstances for that yard, Julian Construction strongly recommends that homeowners only use a licensed professional foundation contractor with many years experience constructing retaining walls on different properties. Retaining wall projects done by inexperienced individuals could lead to a wall not strong enough to hold up the soil, drainage problems (which would damage the wall) or other problems which would lead to having to reconstruct the retaining wall entirely.